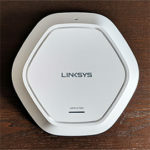 Netgear Orbi and Google WiFi are, without a doubt, still the most popular WiFi systems on the market (yes, even in 2019) and both the Orbi and Google WiFi (along with Eero and, perhaps the Linksys Velop) have shaped the look, functionality and the performance of the new WiFi systems (they also gave them an established place among the consumer-type networking devices). 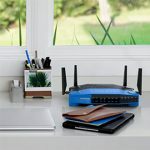 One may challenge the legitimacy of putting a dual-band WiFi system against a tri-band one, but, while a great wireless performance is a very important factor in a home network, some users will always value the stability and the reliability of a router a lot more. The Netgear Orbi was and remains the best performer in terms of raw speed, but, after the manufacturer decided to add new (more radical) features, the WiFi system would often become unstable and would require constant maintenance. Of course, Netgear tried to fix all these issues as soon as possible, but it did help create a certain mindset around their product (and towards updating the firmware). The less powerful Google WiFi, on the other hand, had less significant updates over its year and a half of existence, but it is often praised as one of the most stable and reliable WiFi systems ever released (this also applies to the Eero first and the second generation). So, taking everything into consideration, I think it would be interesting to test these claims and see which of the two systems is the better one for medium to large-sized homes. Note: You can also check out the individual analysis of each WiFi system here: Netgear Orbi and Google WiFi. 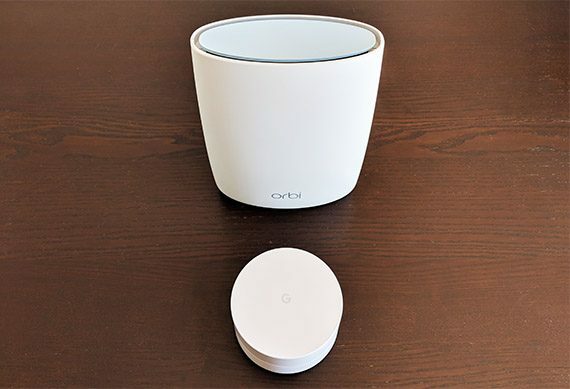 UPDATE 21.03.2019: About two years have passed since I individually tested both the Google WiFi and the Netgear Orbi, so I decided to retest them and see how these systems have withstood the test of time, especially after receiving lots of significant firmware updates. 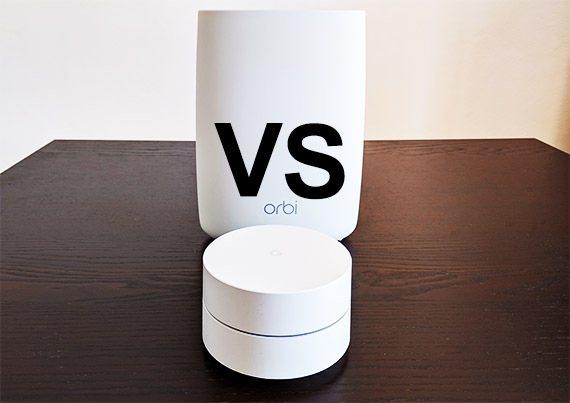 Even if they’re part of the same family of networking devices, if put next to each other, the Google WiFi and the Netgear Orbi share little in common from the design point of view. 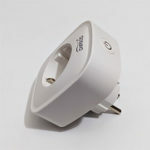 The Netgear Orbi kit consists of two seemingly identical units, each device featuring a tall plastic case (which resembles an air freshener) covered by a white matte-finish (that doesn’t retain fingerprints) and the only visible difference between the two Orbi units is the top side colour: the satellite unit is completely white, while the router unit has a light-blue top. 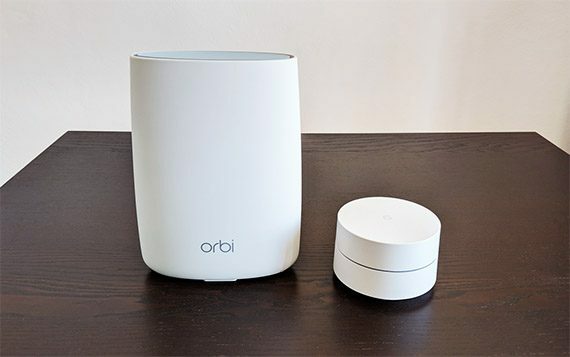 This also highlights the fact that these two devices have different purposes, the router Orbi is the main device that gets connected to the modem and the satellites can either be connected to the main unit or between each other (thanks to the newly received daisy-chaining ability). The Netgear Orbi is definitely the tallest WiFi system (for now), measuring 6.67 x 2.36 x 8.89 inches, but its minimalist design ensures that it is living-room-friendly, especially if you have a modern-type furniture. 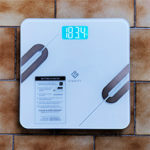 Still, the Orbi is quite lightweight (it weighs around 1.96 lbs), so you need to carefully plan where you are going to position it in the room (it’s ideal to avoid high-trafficked areas, in order to not accidentally push it out of the table). 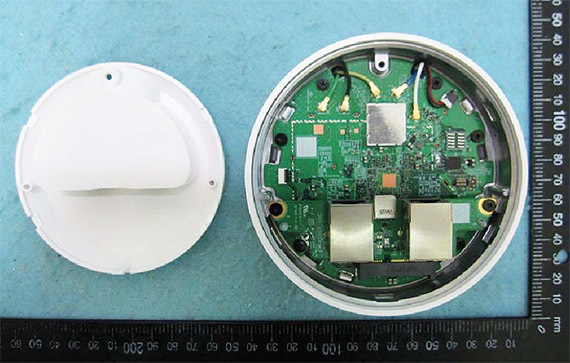 The Google WiFi shares some similar traits, such as the minimalist design approach and the white matte finish, but, unlike the tall Orbi units, every Google WiFi device is about three times shorter and has a cylinder-like shape (resembles a hand-cream recipient). 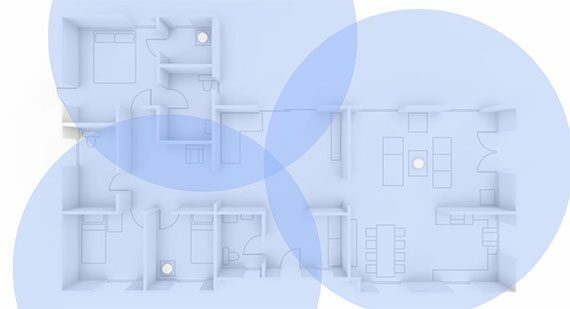 While the two Orbi units are different, the three Google WiFi nodes are identical and any of them can be appointed as the main device which gets connected to the Internet, while the other two will become the additional mesh nodes. 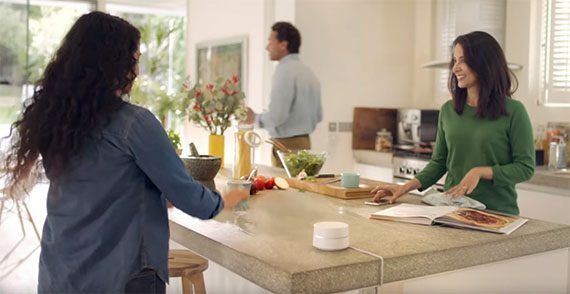 Unlike the Netgear Orbi, the Google WiFi looks and feels a lot more robust (it does measure only 4.17 x 2.70 inches and it weighs 0.75 lbs), so you’ll have an easier time positioning it anywhere in the room, but you do need to take into consideration the fact that Google decided not to add any significant cut-outs for a proper heat management and since the device relies on passive cooling, you need to make sure to position your Google WiFi out in the open (if you put the device inside a closet, it may overheat). Netgear decided to cover the bottom side almost entirely by ventilation holes, as well as the area above the ports which ensure a better airflow inside the case and reduces considerably the chance of overheating. As a consequence, the Google WiFi would run warmer, while the Netgear Orbi was almost completely cool to touch. On the top of both the Orbi router unit and the satellite, there’s a circular LED indicator which will remain turned off when everything is working properly, but it will flash white when the router unit is booting up or syncing (solid white indicates that the device is returning to factory default settings) and, in case the LED is solid magenta, then the router unit is disconnected from the Internet. The LED indicator from the satellite Orbi works slightly different than that on the router unit: the LED will be solid magenta when the satellite Orbi failed to sync to the router unit, it will turn blue for 3 minutes when the connection to the router is good and it will turn amber when the connection is fair. Each Google WiFi is divided horizontally into two parts by a narrow canal in which rests the LED indicator that, similarly to the single LED on each Orbi unit, it shows the status of the system: if the LED indicator is solid green-blue, then everything is working properly, otherwise, if the LED indicator is solid red, then the WiFi node is experiencing an error; if the LED is solid blue, then the device is returning to its default settings, but, if the indicator is flashing amber, then the Google WiFi unit is not connected to the Internet. As with all other WiFi mesh systems, the single LED indicator implementation is a nice idea on paper, but completely non-intuitive in real life, where the user constantly needs to check the manual in order to understand what is going on with the system (both during and after the initial configuration process). 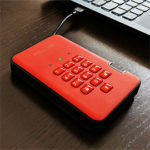 A reliable alternative could be a voice command system which would still maintain the minimalist tone of the devices (the Netgear Orbi supports Amazon Alexa voice assistant and the Google WiFi works with Google Home / Mini). On the rear side of the Netgear Orbi, towards the bottom, there’s a separate area where you can find all the ports and buttons: from the left, there’s the Sync button (WPS), four Gigabit Ethernet ports (the router unit has one WAN port and three LAN ports, while the satellites will use all four ports as LAN), a USB port (can be used for connecting a printer), a Power On/Off button, a Power connector and a Reset button. If you turn the Google WiFi upside-down, you’ll notice that there is a significantly large hole where rest two Gigabit Ethernet ports (by default, these two ports operate as LAN, but, the unit that gets connected to the Internet will use one port as WAN and the other for either inter-node connection or for connecting a wired client) and a USB type-C port for powering up the device (the circular LED light doesn’t go all around the device and it is being interrupted by a small Reset button used for returning the Google WiFi unit back to factory default settings). Verdict: Both Netgear and Google have designed their WiFi systems in a simple and minimalist manner, so you’ll have no problem positioning any unit in the centre of the room (unlike the industrial-looking traditional routers) but, while the Google WiFi may be a bit better looking and feel a bit more robust, the Netgear Orbi is also solidly built and it has two additional LAN ports (which will make a huge difference in day-to-day use), so it wins this round. The Netgear Orbi and the Google WiFi share the same Qualcomm Atheros platform (both have a quad-core IPQ4019 chipset clocked at 717 MHz) and they’re also surprisingly similar for the rest of the build. The Netgear Orbi comes with a QCA8075 Gigabit switch chipset, 512 MB of RAM (NANYA NT5CC256M16DP-DI) and 4 GB of flash memory (Samsung KLM4G1FEPD-B0310 eMMC), while the 2.4GHz radio along with the first 5GHz radio band use the Qualcomm IPQ4019 chipset and the second 5GHz radio band (which is dedicated to the backhaul traffic) uses a Qualcomm QCA9984 chipset. Every Google WiFi unit also comes equipped with a Qualcomm QCA8075 Gigabit switch chip, 512 MB of RAM and 4 GB / 4 MB flash memory, while the 2.4GHz radio and the 5GHz radio bands take advantage of the Qualcomm Atheros IPQ4019 chip. 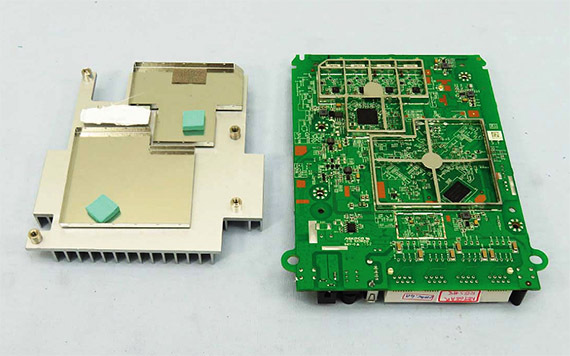 Furthermore, the Google WiFi has implemented the Bluetooth 4.2 technology (CSR102x) and, initially, Google has equipped its WiFi system with a Silicon Labs EM3581 Thread SoC, therefore supporting the ZigBee technology, but, with later models, it seems that it has removed it. The Netgear Orbi decided to steer clear of implementing any smart home hub-related tech (such as ZigBee or Z-Wave) and, instead, it simply added support for the Bluetooth 4.1 wireless technology. The Google WiFi features a maximum theoretical speed rate of 867 Mbps using the 5GHz radio band and 300 Mbps using the 2.4GHz radio, while the Netgear Orbi features a maximum theoretical data transfer of 400 Mbps using the 2.4GHz radio band and 867 Mbps using the first 5GHz radio band / 1,733 Mbps using the second 5GHz radio band. Verdict: The Google WiFi is built almost identically to the Netgear Orbi, but, since the latter has the advantage of an additional 5GHz radio band, it wins this round. 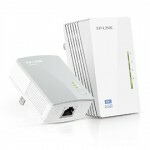 In the beginning, the Orbi system completely ignored the mesh technology and decided to use a router + extender approach, so, the satellite units could only communicate with the main router unit (which is the only device that can be connected to the modem). Afterwards, Netgear included inter-node communication (daisy-chaining), but still, only the router node could connect to the modem (so, it’s still doesn’t function in the same manner as the other WiFi mesh systems) and, more recently, the Orbi system also added the possibility of using the Ethernet backhaul if the band dedicated for the backhaul traffic was not enough. Since both of these features require a significant architectural change, there is a chance that this was the reason why some firmware updates needed more time ‘to settle’ – the latest firmware update (v2.3.0.32) has proven to be the most stable (in my case). 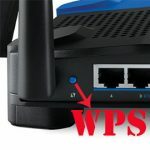 Unlike the Netgear Orbi, the Google WiFi has been stable from the beginning and, perhaps the only significant updates were the added support for IPv6 and the Site Blocking feature, well, until a firmware update from last year made the port forwarding unusable – a couple of months later this problem was fixed, but it goes to show that it can happen to any WiFi system (and even to a giant as Google). The Google WiFi went over the router + extender set up (which the Netgear Orbi initially favoured) and implemented a proprietary form of the mesh technology. 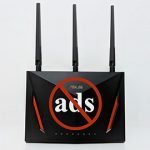 Among its advantages, it’s worth mentioning the self-optimizing propriety, which means that the network finds the best route for your data by taking into consideration the number of nodes, the connected clients, each router’s signal strength, the used channels, the least crowded radio band and more. Other important properties of a mesh network is the self-forming and the self-healing abilities, the former detecting any new added node and using it to create new paths for the data, while the latter scans the network for any offline node and immediately checks the nearby Google WiFi units to see which is the least crowded and which has the strongest signal in order to create a reliable path for the data to reach its destination (so the user won’t experience any downtime). 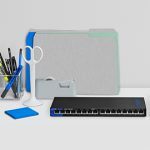 But, while the decision to use the mesh technology in a home environment was a great decision in order to create a more cohesive network, a dual-band WiFi system will have a harder time handling the client connection along with the backhaul traffic. To improve a more crowded network, Google has implemented the Ethernet backhaul feature, so, if you have some cables already installed in your home or aren’t afraid to run some new wires, then it can offer a significant degree of relief to your network and gain more bandwidth. 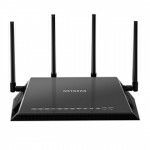 Netgear has taken all the best steps into ensuring that the backhaul traffic won’t be a problem for their Orbi system: first, it uses one of the three 5GHz radio bands (the better performing one) specifically for the backhaul (the clients cannot connect to it) which has translated into a great wireless speed from the satellite (almost the same as with the main Orbi router) and secondly, Netgear decided to take advantage of the Ethernet backhaul, thus allowing its users to also gain a degree of relief in case their network gets overcrowded. 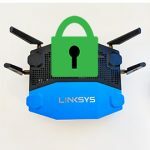 Note: It’s worth discussing the fact that Orbi has just recently added the Ethernet backhaul and with the previous firmware version, this new feature could destabilize the entire system. To regain the stability, Netgear has rolled the firmware back to v2.0.1.4 and more than a month ago has started to roll out a beta version of a new firmware which promised to fix all the present issues (which included some problems with Circle with Disney). I noticed that very recently Netgear has made that beta version official (the v2.1.3.4) and users can now download it to their systems in order for these new features to work properly (so far, the new update seems to have fixed the previous issues, but only time will tell). 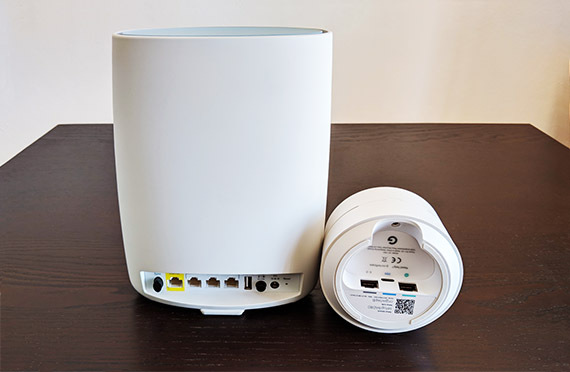 When Orbi had implemented the Ethernet backhaul feature, it did destabilise the system, but a few firmware updates later, the issues seem to be solved. Be aware that when you upgrade to a new firmware, you may need to perform a hard reset on both the Orbi router and satellite units, but it is not necessary if you don’t experience any problems after installing the new software.